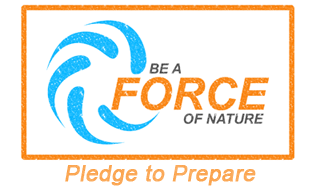 “Be a Force of Nature” is the theme of the first-ever National Severe Weather Preparedness Week, starting this Sunday (Earth Day) and continuing through April 28. The campaign is a joint effort by the National Oceanic and Atmospheric Administration (NOAA) and the Federal Emergency Management Agency (FEMA). Full details – including downloadable posters, media PSAs and emergency preparedness kit checklists – can be found on NOAA’s Weather-Ready Nation Website. While the effort focuses on hurricanes, tornadoes and other catastrophic storms less common in the Pacific Northwest, Oregonians can still learn from the campaign, according to Patrick Corcoran, Oregon Sea Grant’s coastal hazards specialist. In this region, coastal storms generally occur from November to March – but recent trends have shown earlier dates for the first storm and later dates for the last storm of the season. And offshore buoys have measured increasingly higher waves during winter storms over the past 30 years. A result has been more impacts by storms on people and infrastructure, from homes to highways. Corcoran pointed out that although the Northwest is generally spared from tornadoes and hurricane-strength storms, they can happen – and the region is also prone to seismic disasters including earthquakes and tsunamis. “The steps NOAA recommends to prepare for catastrophic storms make good sense for the types of disasters we in the Northwest face, too,” he said.